Hi Everyone! I decided that this week I'll work on some of Mel of "Mel Stampz"projects, templates, and links that she sweetly provides for her blog readers. She also post tutorials for nearly all her creations which I KNOW takes a lot of work and effort. So, to show my appreciation, I'll work on some of her projects and the links that she list on her blog!! I'll be posting on both Card Inspired and Stampin Inspirations depending if I use primarily rubber stamps or scrappy materials. I posted this project here because I used minimal amount of stamping. Mel listed a link of 3x3 purse/box projects so I decided to work on the first link on the list. My next project will be to work on Mel's own 3x3 purse that she kindly provided the template and tutorial. This Stacey's 3x3 box and envie can be found directly here: Click Here Being me, I modified the project a little bit. I took the envelope template and cut the side flaps and rather than using the template for just the envelope, I created 3x3 matchbook style cards with the envelope template. I also created the matching envelopes with the same template. 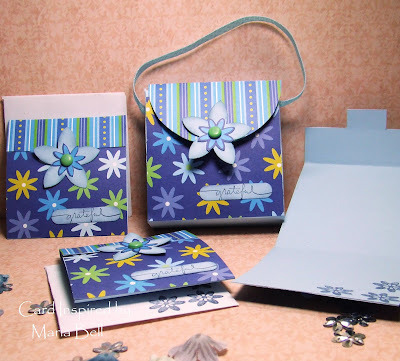 This 3x3 box is actually a box template but I added a ribbon purse handle to modify it so it looks more like a purse that holds the cards and envelopes. Love your colors, they make me happy. I love making these little boxes! You did a fantastic job-those colours are just GORGEOUS! These are awesome! I love our colors and I like how you make them into little matchbook cards! Great job! What a gorgeous project...fabulous! 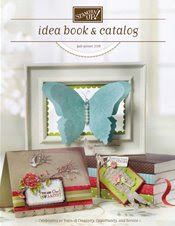 I luv the colors, great gift idea! Maria! 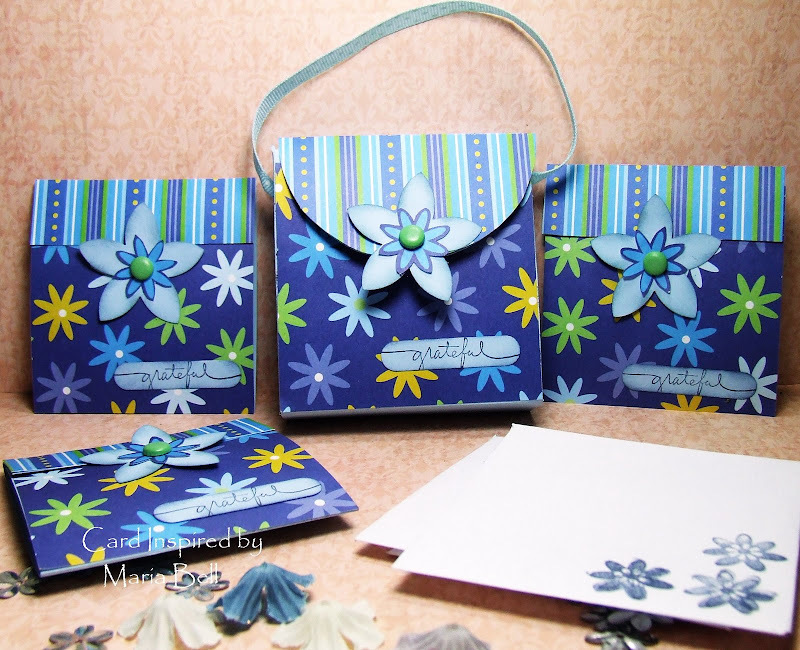 I just love this purse and 3X3 cards to match! Wasn't that post awesome with all of the links to the many purses! I love purses so I can't wait to try out some of them!! very nice, girlfriend!!! love these colors of your DP!! love how you changed things up a bit - das why I wuv you!! so creative!! These are so pretty. Love the colours. This is Gorgeous!! what a wonderful project and lovely gift!! This is SO fun. What a great gift idea!